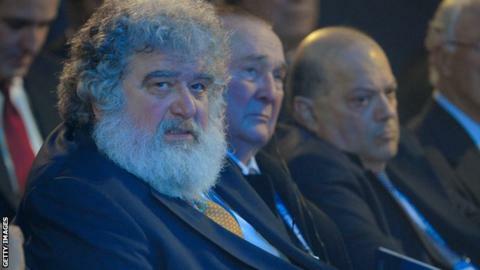 Chuck Blazer - the Fifa official who blew the whistle on corruption within the governing body last year - has been accused of secretly funding the rent on a luxury New York apartment using funds from the football federation he ran. The allegations were made to BBC Sport by Jack Warner, the former president of Concacaf, the football federation for North America, Central America and the Caribbean. Blazer resigned as general secretary of Concacaf in December 2011 but is still a member of Fifa's executive committee. Warner also alleges Blazer misappropriated quarterly payments of $12,000 from Umbro International, one of Concacaf's former commercial partners. In a statement to BBC Sport Jeff Webb, the newly elected president of Concacaf, has promised to look into the "very serious" allegations. In a series of emails to BBC Sport Warner claims that Blazer joined the $18,000 (£11,000) rent for his own Trump Plaza apartment in Manhattan together with that of Concacaf's US office, which is located in the same building. Warner also alleged he and Concacaf's executive committee were unaware Blazer had overseen the purchase, through a Concacaf subsidiary company, of two apartments in Miami's exclusive South Beach district in May 2010. The studio and one bed apartments, legally registered by Concacaf Marketing & TV Inc., were put up for sale in April this year. Estate agents in the area describe the complex where the apartments are located as "luxurious" offering "panoramic ocean views" with "two bayfront pools, five-star Asia de Cuba restaurant, sunset lounge, aqua spa, marina, private beach and two swimming pools." BBC Sport has learned that both properties are now under contract for sale for a collective sum of $800,000 (£510,000). "I did not know of Mr Blazer's purchase of the two apartments in Miami nor the form of payment for Mr Blazer's apartment at the Trump Plaza in Manhattan." "I also do not believe that either was known by the Concacaf executive committee or senior officials of the Confederation." "I do believe that Mr Blazer paid for his rent of this apt [apartment] at Trump Plaza from Concacaf's funds. In other words he lumped his $18,000 per month apt rental with Concacaf's." Concacaf 's general legal counsel, John Collins, has confirmed to BBC Sport that a vehicle, believed to be an eight year old Hummer, is also for sale. When contacted by BBC Sport over the allegations Mr Blazer declined to comment. "These allegations are very serious indeed. "However, at this time, they are just allegations, and we must not jump to conclusions until all of the facts have been gathered and presented. "I will undertake a review of the operations and finances of Concacaf, and if any irregularities are identified during that process, they will be reported to the Concacaf executive committee and the appropriate action taken. "Additionally, if these allegations are proven to be true, they will be disclosed and the perpetrators will be held accountable. "I am presently exploring options as to how best to investigate all the allegations, and will make my recommendation to the Concacaf executive committee, which is scheduled to meet on 14 June 2012." BBC Sport exclusively reported last week that Blazer may have acted unlawfully over a multi-million dollar contract, according to lawyers acting for the football confederation he still represents. Confidential memos - obtained by BBC Sport - allege that Blazer is attempting to claim more than $7m (£4.5m) in unpaid commissions for TV rights and sponsorship deals. Under the terms of a deal struck in 1994 with Warner, who was the then president of Concacaf, Blazer was granted commissions of 10% on all sponsorship and TV rights deals he negotiated. In response to questions over the deal Warner states: "At no point in time have I ever acted fraudulently with Mr Blazer nor have I ever knowingly violated my duties to Concacaf." "It is however informative to note that, to the best of my knowledge, I signed only ONE contract for Mr Blazer and that was in 1994 - a four-year contract." "At the expiration of Blazer's contract in 1998 I advised him that I will not be renewing his contract until and unless it is reviewed and I followed this up with a formal letter I sent to him in 2002, a copy of which letter I still have in my possession." The claim will cast doubt on any argument from Blazer, if he undertakes legal action to recover the $7m commissions, that a new deal was formed after 1998 through the continuation of the arrangement between both parties, known in US law as an "implied in fact" contract. It's during the period of the written contract, 1994 to 1998, that Warner also alleges Blazer misused or misappropriated quarterly payments of $12,000 from Umbro International, an America company that was a forerunner to the current UK-based company of the same name. "As one of Concacaf 's early sponsors, Umbro [International] through Jack Stone, its chairman and owner, [agreed to] supply Concacaf with match balls and a quarterly grant of $12,000," Warner said. "During the term of Mr Blazer's contract the head of Umbro [International] - our main sponsor at the time - said he will no longer sponsor Concacaf until and unless a forensic audit is being done on Mr Blazer's handling of Concacaf 's accounts. "I had a choice to make then - it was either I follow the advice of Jack Stone and insist on a forensic audit of Chuck Blazer or I disregard the advice of Jack Stone and keep Chuck Blazer as Concacaf 's General Secretary. I chose the latter." Asked by BBC Sport if he believed Mr Stone suspected the $12,000 payments from Umbro International were being misused or misappropriated by Blazer, Warner replied: "You are correct." The latest allegations from Warner come one year on from the acrimonious Fifa presidential election that precipitated a raft of officials being brought before the governing body's ethics committee on corruption charges. Blazer compiled a dossier of evidence and reported Warner, along with the then Fifa presidential candidate Mohamed Bin Hammam, alleging that financial incentives were offered to members of the Caribbean Football Union at a meeting in Trinidad. Warner eventually resigned from all his positions in international football last June after being suspended by Fifa pending the outcome of their inquiry, triggering a bitter power struggle for control of Concacaf. Following Warner's resignation, Fifa said the ethics committee case against him was closed and the "presumption of innocence is maintained". Bin Hammam, who continues to deny the allegations, was then banned from football for life by Fifa. His case is currently under appeal at the Court for Arbitration in Sport. Concacaf delegates last month voted to have Blazer removed from Fifa's executive committee but failed to get their motion added to the Fifa Congress agenda in sufficient time to gain its required approval.